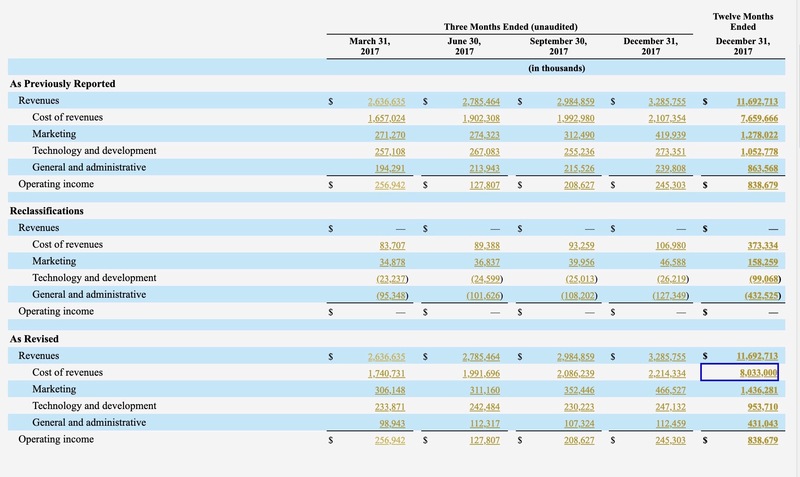 Another day, another example of why attention to detail matters in financial analysis: Netflix ($NFLX) and its most recent annual report, which revised a lot of operating expense numbers from prior years. What was that about? We noticed this adjustment while studying Netflix on our Company-in-Detail page. Netflix filed its 2018 annual report on Jan. 29, and several of the 2017 and 2016 line-items were highlighted as revised. See Figure 1, below. Those cells outlined in the famed ‘Calcbench mustard’ color are adjusted. So we peeked at those revised facts by clicking on the Highlight Revised Facts tab above the line-items. When you do this, a small plus sign appears next to the revised number. 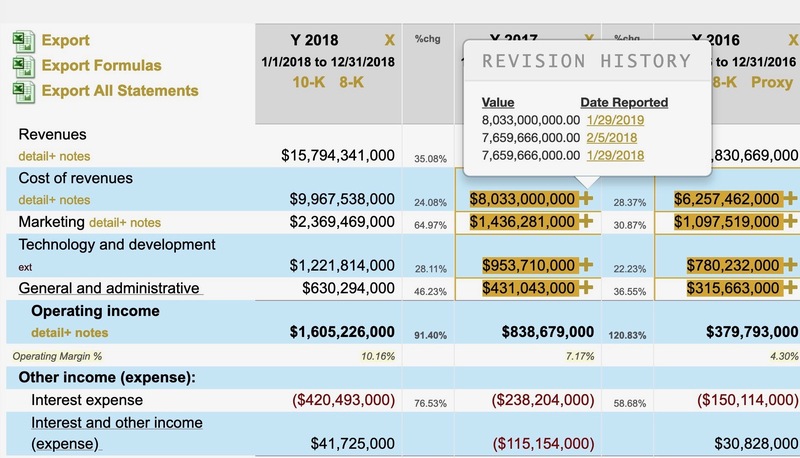 Click on that plus sign and you can see the actual revisions made: what the number originally was, and when the firm revised to the current number seen on your screen. Intrigued, we dug into that $8 billion number for Cost of Revenue in its 2017 fiscal year — and saw that several weeks ago Netflix adjusted that number upward by $374 million. See Figure 2, below. For a moment we felt chest pains; $374 million is a significant amount of money. Then we noticed — revenue and operating income hadn’t changed. So Netflix was only rearranging costs among its line items for Cost of Revenue, Marketing, Tech & Development, and General Administrative. To learn more, we clicked on that $8 billion number and traced it back to the source in Netflix’s 10-K filing. That took us to the Interactive Disclosure tool, where we could read the full details of why Netflix was changing these numbers. The Company is making this change in classification in order to reflect how the nature of the work performed by certain personnel has changed to be more directly related to the development, marketing and delivery of our service as a result of the continued evolution of the Company’s strategy to self-produce and create more of its own content rather than license or procure it from third parties. This change in classification will also align external presentation of personnel related expenses with the way that the Company’s chief operating decision maker expects to assess profitability and make resource allocation decisions going forward. Netflix also provided a table to show all reclassifications by line-item and year, which was mighty nice of them. See Figure 3, below. Our heart rate returned to normal after reading that explanation and we put away the nitro. Still, it’s another reminder that firms can revise financial filings all the time — and diligent financial analysts should want to know why. With a few keystrokes to jump around the Calcbench data archives, we did find out why. So can you.